Jeans loves it outside. At out apartment, I used to let him out onto our front porch, but I would block the stairs so he couldn't run off (I was paranoid but certain he would). 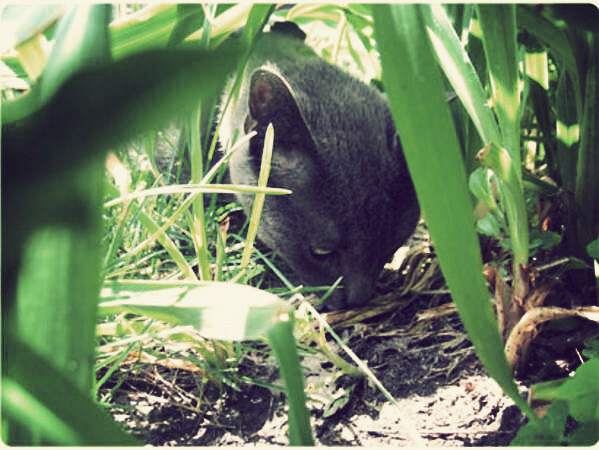 I knew he really enjoyed being outside, but I was so nervous I'd lose him that that was the extent of his venturing outdoors. Until now, though! I bought him a harness and leash two days ago, and yesterday he had his first adventure outside, and he liked it a lot! 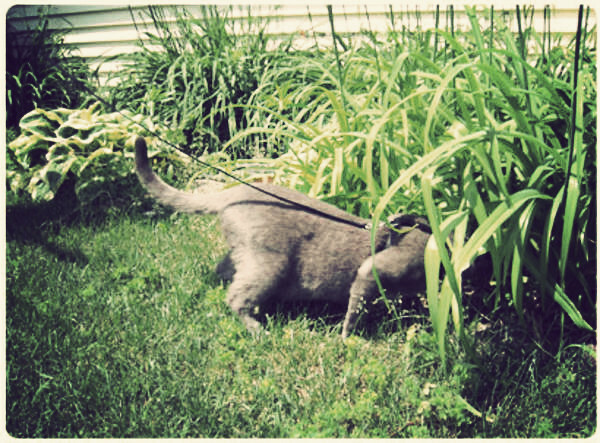 He was a little unsure of things, I don't think he'd ever walked on grass (well, maybe when he was a baby stray kitten before he was brought to the Humane Society). 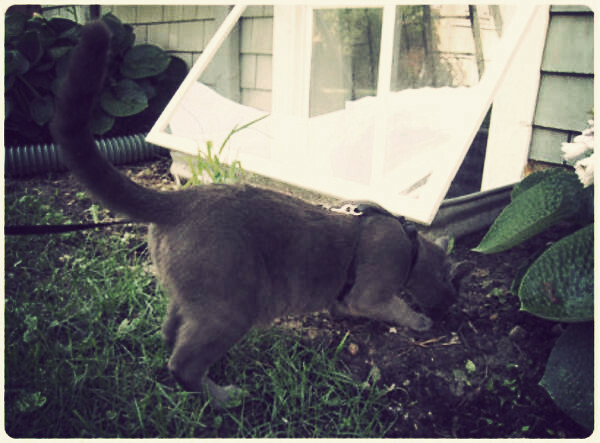 There was lots and lots of sniffing plants to be done. He really liked the deck, I think because it's painted dark brown and gets pretty warm. His new favorite thing is laying in the sunspots the skylights make on the kitchen floor, and I think the deck was like one giant sunspot to him! He really didn't mind getting the harness on. I think it might be because we usually put a t-shirt on him at night. I know, I know, it sounds silly! He gets a little hyper at night time, either right before bed so we can't fall asleep, or at five in the morning when he decides to knock stuff off the dresser or paw at the door. We put a shirt on him before bed because he just instantly lays down at our feet and falls asleep, and stays asleep all night. It's calming to him, for some reason. 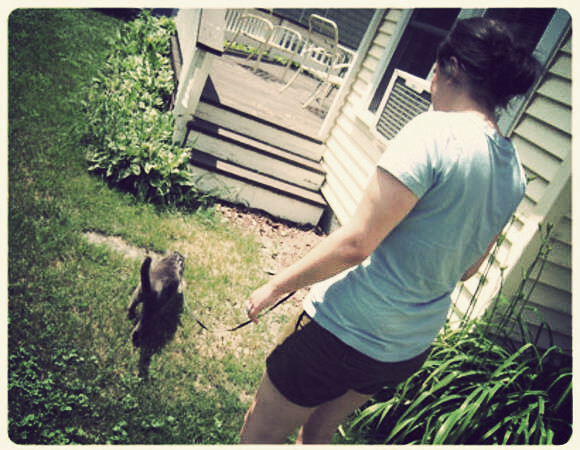 We were on our way to the boat yesterday, and we wanted to walk him around the neighborhood before we left. We started to go down the street and he was fine, but then a car drove by and he got pretty freaked out. We went home after that. All in all, I think the harness is a hit with him. I took him out again today, and all I had to do was pick up his harness and get his attention, then he was racing past me to wait at the back door! So cute. awww very cute! surgeon got his stitches out today, and is allowed yo play outside again. He is such happy kitty now! Aww. I've considered getting a harness for my cat, but he doesn't leave my room to begin with so it's never really been necessary. i have a harness for my kitty, too! they are great! i was so scared to let my kitty outside for the first time when i didn't have one. 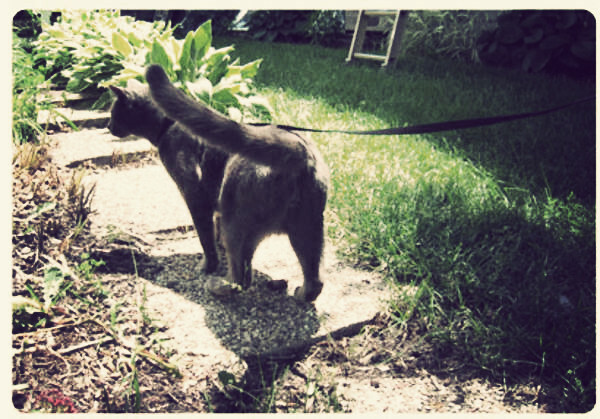 glad your kitty loved the outside adventure! @Sonya: It started out in a pretty lame way... I had a good friend Mary who lived in our old apartment building, and we were both silly cat ladies. She had a girl cat named Uter, and we made up a goofy story that Jeans and Uter were going to get married (so lame!). I found a discounted doggie shirt at a pet store around Valentine's day that looked like a fake tuxedo, so I bought it and took pictures of Jeans in it and made Uter a V-Day card from Jeans. It was a silly joke between Mary and I, but I realized the effect the t-shirt had on him. Back then he was especially out of control, he was constantly running around and he would bite us a lot, so it really helped. Now we only use one sometimes. @Jessica: I was nervous too! He did fine though. Aww..Cute kitty! I know how you feel about blogger. Mine was down since late Sunday night. I finally got to post my Sunday post today! Jeez! 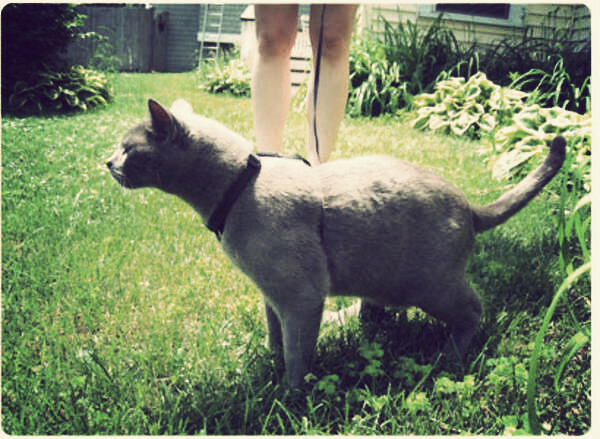 I've been wanting to get leashes for my cats (the harness kind) but I am so afraid of them slipping out of them.